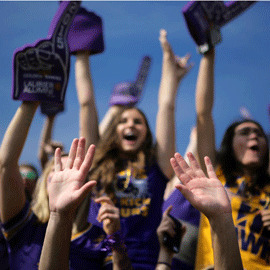 The Huffington Post recently published an article, ranking Laurier in the top 5 for sports and recreation programs at universities across Canada. Laurier’s renowned school spirit, number of varsity student-athletes and top-notch facilities were all cited as reasons for its ranking, but there’s so much more to Laurier’s athletic experience. On Laurier’s Waterloo campus, the newly renovated two-storey, glass-walled Athletic Complex (AC) features an Olympic-length pool, state-of-the-art studios for dance and aerobics, a large fitness centre, a three-court gymnasium, squash courts and a rock-climbing wall. Laurier’s Athletics and Recreation Department also employs over 300 Laurier students to run operations, programming and events. Many of these student leaders have gone on to successful careers within the sports industry working for companies such as the National Hockey League, Toronto 2015 Pan/Parapan American Games and Maple Leaf Sports and Entertainment. Soon to be under construction, the Laurier Brantford YMCA will include gyms, an aquatics centre, fitness spaces, and classrooms among other shared spaces. Currently, Laurier’s Brantford campus students have access to the Wilkes House recreation complex and the Brantford YMCA. Laurier’s Waterloo campus recreation programs offer something for every Golden Hawk. Personal training, dance, group exercise from Zumba and bootcamp to yoga classes, swimming lessons and first aid training, and an extensive selection of intramural sports are available to all students at any fitness level. Free sessions are offered at the beginning of each semester for students to try out new things and during exams to help students work-off stress and maintain wellness. At Laurier’s Branford campus, students can participate in co-ed intramural sports and, for those who are a bit more competitive, can join extramural teams such as hockey, dodgeball and soccer, to compete in Ontario Colleges Athletic Association (OCAA) sport leagues with other colleges and universities. Laurier is well known for its school spirit and nothing brings Laurier students and alumni together like a varsity event. On Laurier’s Waterloo campus, students start the year by donning their purple and gold for the O-Week football game. In late September, thousands of current and former Golden Hawks gather for Laurier’s Homecoming football game at University Stadium. During the winter semester, students cheer on Laurier’s basketball and hockey teams with the annual Winter Carnival game to kick off the New Year. At Laurier’s Brantford campus, students, alumni and the community come together to celebrate Homecoming at a Golden Hawk varsity hockey game during the fall semester. Laurier students are notorious for volunteering – when it comes to sports, there’s no short supply of students looking to organize activities around their favourite sports. Over 500 students on both Laurier’s Waterloo and Brantford campuses participate in a wide variety of sport clubs including the Dragon Boat Club, Competitive Dance and the Canoe and Kayak Club. Laurier is proudly represented by over 500 varsity student-athletes spread across 18 Ontario University Athletics (OUA) and Canadian Interuniversity Sport (CIS) sanctioned teams. Many Golden Hawk alumni have gone on to achieve great success in international events or in professional leagues throughout the world. With a history of 13 National Championships and 67 Provincial Championships, the Golden Hawks have shown that you don’t need to be a big school to shine when it matters most.